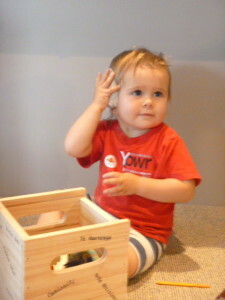 Imagine Box - What is Heuristic Play? Heuristic play is the core of a child’s curiosity to explore an object and to discover what it can do. In a world full of plastic and fast paced digital objects it’s important for your little one to be given the opportunity to discover natural objects in their own time and space, as it enhances their development. Play is how children best make sense of the world; it also gives children a chance to be in control in a world where they have little control over anything else. There is a lot of information on heuristic play on the internet and a quick search will give you many ideas. Present it in a quiet environment away from other toys and distractions. Be present to keep it safe. Sit back and observe and let them be in control. Put it out only a few times a week to keep it a special experience. Add safe kitchen and household items for variety. Change the contents of the box on a regular basis or just keep adding to it, collecting things from places you go is a great way to remember all those adventures you go on.